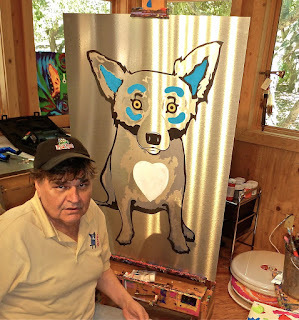 Musings of an Artist's Wife: George Rodrigue: "Fun for Me"
George Rodrigue: "Fun for Me"
As Rodrigue Studio celebrates its 25th year in Carmel-by-the-Sea, California, I’ve reluctantly stared memories hard in the face, piecing together, without George, a history that’s all about George. As is the case throughout his life, a central aspect of the story exists within his artwork. “It’s got to be fun for me, or I don’t do it,” said George often about painting. It wasn’t the painting itself, however, but rather the act of painting and the solving of the puzzle that he found "fun." I can see him in my head explaining this, holding an imaginary brush and palette. “I love the feeling of applying the paint to the canvas,” he would say. 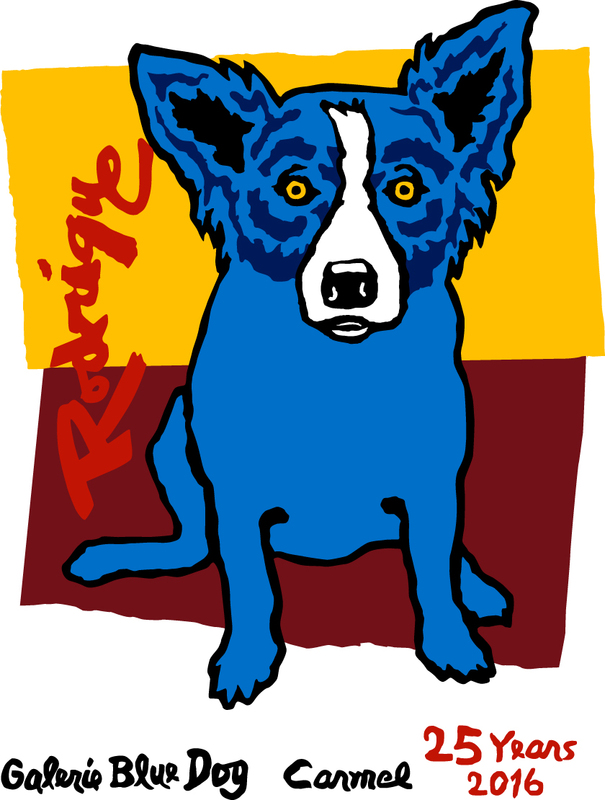 The Blue Dog is not Snoopy; it's not a character. George winced at the word ‘whimsical’ and was more likely to embrace descriptions like mysterious, mythical, regional, naive, surreal, and abstract. I've always taken George's artwork seriously, in some ways now more than ever, as I search for the man himself within his paintings. For this exhibition, I part with my paintings for six months, because I know that ultimately they have a life of their own ---certainly beyond me, and possibly even beyond George. And they need to be seen. Prior to the invention of electricity, religious art was often framed for Catholic churches using gold leaf. The surrounding candlelight illuminated the gold, which illuminated the painting. I sought to replicate this in my rented Guadalupe Street Carmel cottage, where I hung Immaculate Dog with reverence above the fireplace, flanked by a family heirloom ---- Renaissance-style candelabras. It so happened that Galerie Blue Dog’s neighbor on 6th Avenue, artist Loran Speck (1943-2011), was not only a gifted painter, but also a craftsman who hand-carved and gilded frames in the traditional style. A gentle and meticulous man, it took Loran two months to complete the beautiful wooden and genuine gold leaf frame for Immaculate Dog….. and it took me one year to pay for it. Once I began traveling with George, friends and family often used my cottage while I was away. Nearly every time, the thank-you note included a mention of an evening before the fire, discussing Immaculate Dog. It was my most prized possession and the showpiece of my Carmel home. “Because you’re one Hot Dog!” laughed George in 1994 as he hung this canvas, his first painting of me, just inside the front door of Galerie Blue Dog, Carmel. Unlike our wedding portrait (below) the dog looks straight out, while I look up --- so that my gaze links the three elements in a surreal composition that, like most Rodrigue paintings, defies explanation. Even though George gave me the painting, he insisted that it remain on view in the gallery. Some people laughed, and some were confused. But I never found it funny, and I was mesmerized by George’s interpretation of me. Today it’s my favorite of his paintings. It hangs in my bedroom and is the first and last thing I see each day. No matter how much I study it, the meaning, like the meaning of life ...and loss... eludes me. In 1995 George painted a second version of Hot Dog Halo, but seven feet square and without the hot dog, calling it Chanel #5. The canvas went on to hang in numerous installations, including The Time is Always Now Gallery in New York City, and the store windows of Bergdorf Goodman in New York and Neiman Marcus in Dallas, Houston, and Honolulu. 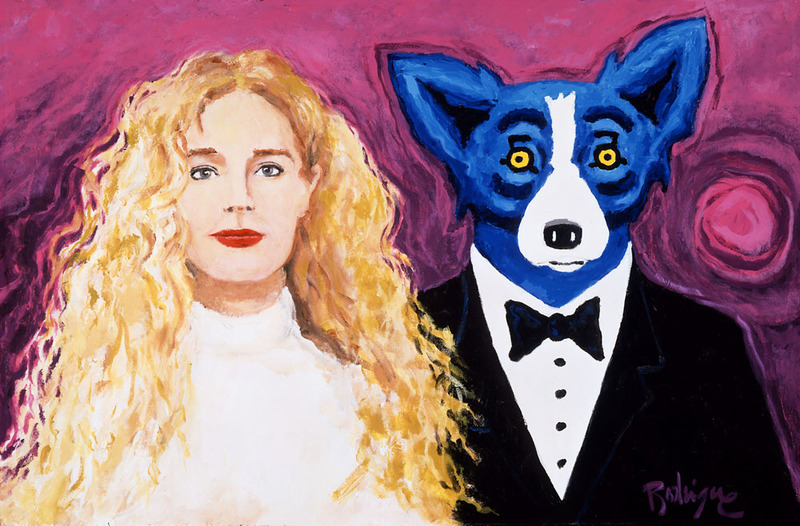 In 1997 George surprised me with the painting Wendy and Me as our wedding portrait and the cover of our invitation. He approached the painting and his idea with a structure and purpose that reflects multiple meanings. What may seem funny on the outside reveals deep and universal themes, such as the mystery of life, the inevitability of death ….and, certainly in the case of this painting, love. Throughout his career, George connected with the Modern Cezanne, the Surreal Dali, and the Regional Thomas Hart Benton, as opposed to the Contemporary Multitudes. Although most often linked to Pop Art by others, he was influenced by numerous movements (even though he rarely admitted it publicly), ultimately creating his own direction. In 2011, reflecting on his failure to find gallery representation for his Cajun paintings, he said, “My style was outdated and out of touch with contemporary directors that viewed their shows as a reflection of what was going on in New York.” Read more. It wasn’t until his last few years that George found a kinship, once again in his own way, with the Contemporary art movement. It might be said that he formulated his own Minimalism, where scale, materials, and technology compete with the subject for importance. George the person was as enigmatic as his paintings ---confident, serious, and complex---- while at the same time humble, laughing, and down to earth. He didn’t question his decisions, in art or in life, because they came from within the big picture of his role in art history, and the even bigger picture, a legacy and lesson to all who knew him, of following his heart.